I have uploaded my pictures (I have included two pictures of me two Eric's great series to have full rounds) on the tournament's page. Thank you for this beautiful day chess with you. Thank you to the Dutch team (Hans and Ruud) Christian, Steve, to the organizers (Patrick and Alain), Eric G. and Jean-Robert. thank you for the kind words. I was very happy to meet you and Ruud and I hope we have the pleasure to have both of you next year. The games are now available, and I wish to thank again all players for taking notes during the games. The Dutch Armada has arrived home. For me ,who didn't speak French at all,it was no problem becaus Christian speaks German and French so a translate was quickly made. So the tournament was friendly and peacefull. Alain was the Empire ,and arranged each round on his computer. At the end the Nigel Short was the winner altough he had many luck against mine 68000XL wich made in a clearly winning position a huge error and even lost the game. If..if as u can see at the tabelle on the end. Guys it was very interesting to meet u and to the next time. Paris 2009 was yesterday and ended with a clear victory of the Nigel Short from Ed Schroeder, operated by Christian. Thanks a lot to all participants... and see you next year ! well lets say it took the bus in a slightly wrong direction. But finally it saw the error of its ways and finally got there where it belonged. Now I am really ready for Paris! do you think you will receive it in time? is it the 24 MHz version which appears on wiki ratings ? or simply a joke ? Anyway, the normal one is strong enough for me (and it was both new and cheap). Is it really stronger? I have on several occasions had my finger almost clicking on one but always restrained myself because of not really wanting another of the same. Actually it turned out to mean "Up a creek without a paddle". But we did not know that at the time. P.S. what does "misrouted" mean in German??? Martin posted a game of Resurrection Fruit 05 v Mephisto III where III kept pushing pawns missing Mates in 2 and 3, in order to queen pawns. yes this was an interesting thread. Therefore I will take my Mephisto III to Paris. The others will happily give me queen odds...Alain? Hand? I one played a tournament between Mephisto III and Tasc R30. The R30 needed a handicap, so I did set him from expert to easy. It did not help the Mephisto III though, he got one draw out of some 10 games. I performed this test for a friend of mine who wanted to buy a R30 and his a moderate chessplayer himself. It may be a close run thing what with the snow, HM Customs, Heathrow.......but it should arrive by May 17th. Now I am hoping to having two chess computers in the tournament. 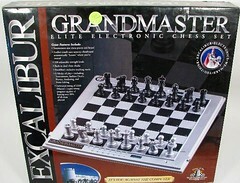 Has anyone played a handicap chess computer tournament? Either giving piece and/or move odds, or instead the winner is the entry which exceeds the Elo predicted result by the biggest margin? That way you can have chess computers of widely different abilities playing. ... and most of us will be able to speak more or less English (of course with the awful French accent). A handicap tournament eh ? hmmm I was thinking along the lines of someday playing a little tournament where each machine is set up with a maximum of for example 4 half-moves (ply) and see what happens. Or an under 10 Mhz tournament Or A World League between manufacturers where randomly 6 machines are picked from within each manufacturers computers. And placed as board 1 - 6. There is so much that could be done with our little computers. The possibilities are limitless! As for the Excalibur Grandmaster I always mess up a game somewhere along the way trying to move the captured piece before the capturing piece.